For the 2016 film, see The Girl with All the Gifts (film). Melanie – test subject number one, a host of the Ophiocordyceps unilateralis fungal infection. She has a brilliant intellect. Very fair skin, long hair, about ten years old. Miss Helen Justineau – a compassionate teacher with a psychology background, who has become attached to the child subjects of the military-run experiment at Hotel Echo. She always wears one item of red in her clothing or accessories. She has very dark skin and long black hair. Sergeant Eddie Parks – a battle-hardened, non-commissioned officer who is acting as field commander of the Hotel Echo military complex. He has a wobbly, diagonal scar which makes his broad, flat face asymmetrical and inconceivably ugly. Dr. Caroline Caldwell – the scientific leader of the study taking place at Hotel Echo. She is the teachers' boss. She is obsessed with finding the cure to the disease. She wears a white coat, red lipstick and compulsively clicks her pen. Private Kieran Gallagher – a young soldier at Hotel Echo. Mr. Whitaker – the only male teacher at Hotel Echo. Dr. Jean Selkirk – a teacher at Hotel Echo, and Dr. Caldwell's surgical assistant. Miss Mailer – a teacher at Hotel Echo. "Hungry" children: Anne, Kenny, Ronnie, Lizzie, John, Steven, Miles, Zoe, Xanthi, Marcia, Liam, Siobhan, Tom, Joanne, Andrew, Gary. Twenty years ago humanity was infected by a variant of the fungus Ophiocordyceps unilateralis. The infected, referred to as "hungries", quickly lose their mental powers and feed on the flesh of healthy humans. The disease spreads through blood and saliva, but can also spread through spores created by the fungus. In England, the few surviving uninfected humans either live in heavily guarded areas such as Beacon, or roam in packs of hostile, scavenging "junkers". The authorities in Beacon set up a remote military base for the study of a specific group of child hungries. They, unlike others, are able to retain their mental powers and only lose control when they get too close to human scent. Soldiers, led by Sergeant Eddie Parks, find such child hungries and bring them to the base, where they are educated by teachers and tested by the head scientist, Dr. Caroline Caldwell. This often means she vivisects the children, which Helen Justineau, a behavioural psychologist and teacher at the base, dislikes. Justineau sees the child hungries as people, and is especially fond of Melanie, a 10-year-old with a genius-level IQ. Melanie loves Justineau as a surrogate mother. Like the other children, Melanie does not understand that she is different from the adults. Dr. Caldwell, who believes that she is close to a cure for the fungus, chooses to dissect Melanie. As Justineau interrupts and tries to save her the base is attacked by a group of junkers and hungries; Caldwell is badly wounded, and in saving Justineau, Melanie eats flesh for the first time, awakening the "hunger" of the fungus. The three find Parks and Private Kieran Gallagher, and flee the base together. The group decides to travel to Beacon, 74 miles away, but the adults argue over whether to bring Melanie. Parks only agrees after placing a muzzle and handcuffs on the child; Melanie cooperates, now aware of the danger she poses to the others. Melanie proves useful to the adults; hungries do not attack her, and she can lead them away from the humans. While Caldwell still sees Melanie as a specimen, the others begin to trust the child. After several encounters with hungries, including a few adults that also retain some human-like behavior, the group finds the mobile laboratory Rosalind Franklin. It was built soon after the epidemic began with state-of-art facilities for experimentation and attack, but disappeared on its research mission. Caldwell, who is dying from sepsis, uses its equipment to urgently continue her research. While Melanie sates her hunger away from the others by eating wild animals, she finds a group of child hungries. Melanie sees that they, too, retain their mental functions, although they have no language of their own, being uneducated. Afraid that they will be experimented on, Melanie instead tells the adults she saw a large group of junkers, but reveals the truth to Justineau. Gallagher, scared of junkers, flees the lab. He is found by the intelligent hungries, killed, and eaten. While Parks and Justineau search for Gallagher, Caldwell—obsessed with finishing her research before dying—captures one of the intelligent hungries and experiments on him. She makes remarkable findings but does not let the others inside, fearing that they will interfere. Melanie finds a giant mass of fungal fruiting bodies that have grown in the years since the infection began; while there are enough spores to infect the entire world by air currents, the pods that contain the spores (sporangia) do not open on their own. Melanie tricks Caldwell into letting her inside. Before dying, Caldwell shares her findings with Melanie: There is no cure or vaccine for the fungus. Intelligent hungries are second-generation ones, conceived by hungries who retained some human behavior. Those born in this way retain their mental abilities. Outside the lab, Parks and Justineau are cornered by hungries. Melanie frightens them away, but Justineau is knocked unconscious and Parks is bitten and infected. Parks asks Melanie to shoot him before the infection cycle finishes so he does not turn into a hungry; she agrees to do so. She asks him to shoot the mass of spores with a flamethrower, deducing correctly that the environmental trigger to open the spores is fire. Before Melanie complies with Parks' request to kill him, she explains that as long as there are healthy humans, the war between them and the hungries will continue. For second-generation hungries to be born and rebuild the world, every human must first be infected. Justineau awakens in the Rosalind Franklin. Melanie leads her to a group of intelligent hungries, to whom Justineau, wearing an environmental protection suit, starts teaching the alphabet. 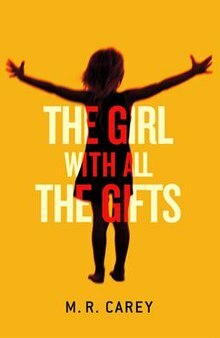 The Girl with All the Gifts has received acclaim from critics, who praised its variation from typical zombie fiction as well as the depth of its characters. Torie Bosch of Slate called it a "crossover horror at its best" and wrote: "It's a welcome shift from the focus of many zombie stories ... The Girl With All the Gifts turns eating brains from the usual empty-calorie snack into a full, complex, palate-challenging meal." Writing for The Guardian, James Smythe praised the book as being "original, thrilling and powerful" and wrote: "Were the characters not so strong, the book might fall apart. The plot is rather slight, and the ending feels a little rushed; but the characters are so well drawn and so human that it's impossible not to feel for them." Miles of Entertainment Weekly concurred, writing: "The character at the story's heart may have no pulse, but Melanie is empathetic and sympathetic, and her deeply tragic existence is proof that zombie tales can elicit an emotion other than fear." While NPR's Genevieve Valentine was critical of the protagonist's narrative, which "veer[ed] occasionally and abruptly in one direction or the other", she still found the book to be "grotesque and grimly hopeful by turns, underscored by lovingly detailed infection in both metaphorical and very literal terms: Spores and hopelessness are equally contagious." Not long after the book's release, M.R. Carey announced that the book would be made into a movie, and that the movie's title would differ from the book; it was announced as She Who Brings Gifts. The title was changed in June 2016 to match the book. Filming began in May 2015, with newcomer Sennia Nanua in the lead role of Melanie, Gemma Arterton as Helen Justineau, Glenn Close as Caroline Caldwell, and Paddy Considine as Sergeant Parks. TV veteran Colm McCarthy directed the movie. It is McCarthy's second feature-length film. The film's screenplay was adapted by Mike Carey. The film, with its title changed back to match the novel, was released on Friday 23 September 2016. In 2017, Carey published a prequel novel entitled The Boy on the Bridge about a team of scientists and soldiers on a mission to find a cure for the fungal infection, which is set some time before The Girl with All the Gifts. ^ a b Bosch, Tori (8 July 2014). "Braaaiiins: The Girl With All the Gifts, a zombie novel of ideas". Slate. Retrieved 2 August 2014. ^ Smythe, James (15 January 2014). "The Girl With All the Gifts by MR Carey – review". The Guardian. Retrieved 2 August 2014. ^ Raymer, Miles (30 July 2014). "The Girl With All the Gifts (2014)". Entertainment Weekly. Retrieved 2 August 2014. ^ Valentine, Genevieve (11 June 2014). "'Girl With All The Gifts' Is A Thriller With (Sharp, Scary) Teeth". NPR. Retrieved 2 August 2014. ^ "The Next '28 Days Later?' Watch The Trailer For 'The Girl With All The Gifts' Starring Glenn Close & Gemma Arterton". Theplaylist.net. Retrieved 2017-06-06. This page was last edited on 4 March 2019, at 18:47 (UTC).